Vogue is possibly the most known magazine in circulation today. It has always evolved with the times, and set the standard in the fashion industry. Vogue magazine is a true reflection of the modern woman. Although Vogue began in the United States, the magazine is now published in several countries around the world. Vogue's September issue represents the start of fall fashion. Some even call it the fashion bible. Here are my 5 favorite September 2012 Vogue issues. Dutch Vogue-- Dutch model Ymre Stiekema looks perfect in this embroidered blazer and thigh high boots. German Vogue-- A cover with Selma Hayek in a fitted Gucci gown can only be called greatness. The 45 year old Mexican actress and mother looks flawless. British Vogue-- American model Karlie Kloss is rocking this modern 80's look. This cover is a true reflection of British fashion. 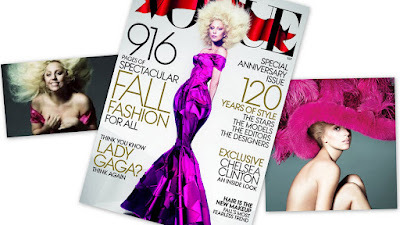 U.S. Vogue--The one and only Lady Gaga graces the cover. Photographers Mert Alas and Marcus Piggott captured the pop sensation in a way that we have never seen her. Lady Gaga remains true to her "Gaga-ish" style, however, the cover and spread is elegant, vunrable, and chic. 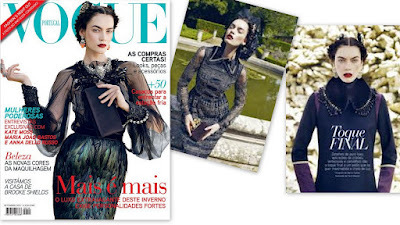 Portugal Vogue-- I love the styling in this editorial. Model Patrycja Gardygajilo looks amazing in the modern version if Portreguese attire. hi I’m new to blogging. great blog! Im following on google and! My favourite is the Vogue Portugal cover. I also like that Vogue Paris had 3 different covers.